But, first, a disclaimer. 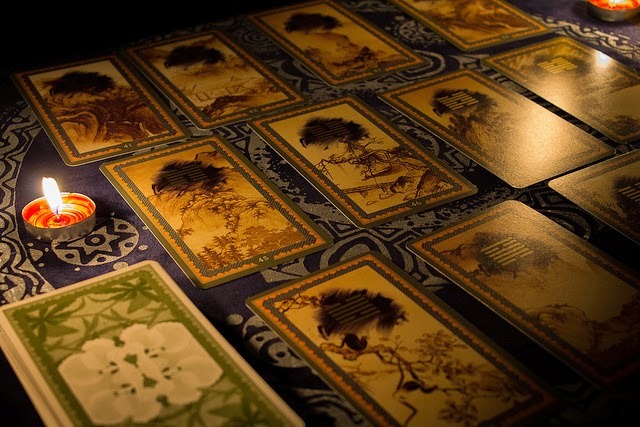 For me tarot cards, though beautiful and thought provoking, and though they have a rich history, are simply cards: rectangles of paper printed with colorful inks and published by U.S. Games Systems Inc. They are no more intrinsically magical than a box of Cheerios. But there’s no reason why we can’t use the Tarot as a creative aid. So, in that spirit, I put together a card spread intended to help writers prime their idea pumps. Remember, we don’t have to make all our decisions about the character right away. Her outlines will likely become clearer once we start thinking about the shape of the story. That’s not terribly informative so I’ll do an example spread and step through it card by card. 8. A person, situation or personality trait that the protagonist must overcome (deal with/integrate) if they are to achieve their goal: The Tower. I think part of the key to success here is to let your own creativity take the lead and not to be too concerned with the meanings that have been associated with the cards. Remember, we’re just using the cards as a guide, as an intuition pump. If you would like to completely ignore the traditional meanings and come up with your own based on the card itself and what those images suggest to you, please do! There are two kinds of cards in tarot decks: majors (or trumps) and minors. In most modern decks there are 21 trump cards which reflect universal themes and minor cards which reflect personal themes. The minor cards are divided into four suits: wands, cups, swords and disks (or pentacles). When I look at this spread I see cups. Yes, there are the same number of cups as swords, but the II of Cups in the 9th position combined with The Empress as the protagonist’s end state suggests (to me at least) a love story. 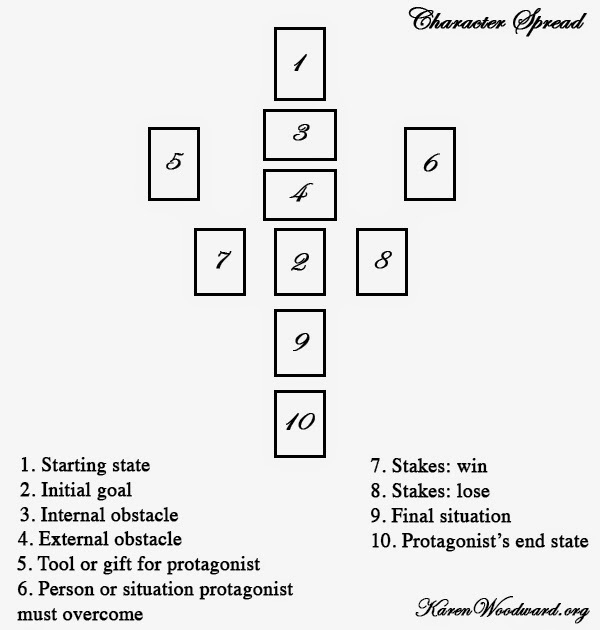 The first card indicates the starting state of the character. What is the single biggest influence on them? Here we have the six of swords. This is the Science card or, alternatively, the Lord of Learned Success. It indicates that our protagonist’s intelligence as well as her sense of right and wrong is balanced. She can see the solution to a problem and also has the guts to do the right thing. But her intelligence and courage are about to be put to the test. What this means: The protagonist’s life, her world, is in balance. She’s at a good place, all systems normal, and she’s grown comfortable coasting along. The four of pentacles has to do with material gain, with wealth maintained by law and order. In our spread this card has to do with the protagonist’s initial goal. This card tells us what she’s shooting for. She wants riches, wealth, the American Dream. This card also reminds us that her success, if achieved, may be fleeting. 3. The main internal obstacle to the protagonist’s success: VIII of Swords. 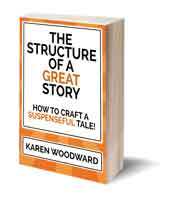 In most stories there is both an internal and external obstacle to the protagonist achieving her goal. The card we’ve drawn for the internal obstacle is the eight of swords. The protagonist is anxious. I’m going to say that the protagonist has trouble with anxiety. She either feels paralyzed and can’t make up her mind or else keeps changing her mind, trying out one new thing then another. If she continues like this, she won’t be able to attain her goal. 4. The main external obstacle to the protagonist’s success: X of Swords. This is the external obstacle to the protagonist’s goal of living the good life; that is, of filling her life with material riches. Many people see the death card, the 13th trump, as indicating the end of life when, actually, it only indicates a profound change. Unfortunately, if one wants to welcome something new into one’s life—a new job, a new outlook on life—one often needs to first get rid of the old job, the old way of thinking. One thing needs to die for another to be born. The ten of swords, though, indicates ruin. And, yes, sometimes death. This is not a feel-good card. So—thinking about how this card could fit into our love story—I’m going to take it that the external obstacle to our protagonist’s dream of material success is something that could either kill her or kill her dream by permanently cutting her off from her goal. This is a love story so the antagonist/nemesis is the man (or woman) the protagonist will fall in love with. 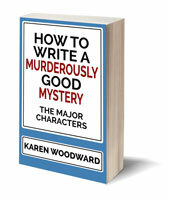 But this can’t happen right away; if the protagonist and antagonist aren’t kept apart there will be no story. (Girl and boy see each other, fall madly in love, and ride off into the sunset together isn’t going to keep anyone turning pages!) So, although the protagonist feels irresistibly drawn to the antagonist, she needs to realize he is all kinds of wrong for her. She thinks: Whoever I end up with, it’s not going to be him. The protagonist wants material success so let’s have it that the man she’s drawn to isn’t wealthy. Perhaps he’s a scientist. Although he makes a decent wage he’s too focused on, say, developing a cheap, biodegradable fuel that will save the environment to worry about money. That’s it for today! I’ll pick this up in my next post. Update: The next and final part of this two part series is here: Plot Wheels And The Tarot: Part 2 of 2. Photo credit: "I_Ching" by Cristian C under Creative Commons Attribution-ShareAlike 2.0.